Part 2: What do we know about the progress of teenagers with Down syndrome, their daily lives and their needs? Part 1 of this article was published in Down Syndrome News and Update Volume 2 Issue 2. The teenage years are a time of considerable development for all young people as they move from dependence on their families towards independent adult lives. This article follows on from the first article in the last issue (Down Syndrome News and Update 2.2 p.46) and presents the findings of our recent research study in more detail. This study collected information on all aspects of the development of a representative group of 46 teenagers. The reader is referred to the first article for details of the research and the data collection. The previous article presented the broad trends and indicated clearly that teenagers with Down syndrome are making considerable progress in all areas of their development during their teenage years. On page 47 of the last issue Figure 1 illustrates significant progress in practical daily living skills, in social skills and in spoken language and literacy between the ages of 10 and 20 years. There is considerable variability in the progress of teenagers with Down syndrome, with some acquiring skills faster than others, but everyone tends to still be making significant steps forward. We certainly do not have evidence of a 'ceiling' or 'plateau' in development for individuals with Down syndrome in childhood that used to be suggested by teachers and researchers. It is also clear to us from our practical experience that most young people with Down syndrome continue to learn many new skills and increase in confidence and independence right through their early adult life. For example, the first author's daughter Roberta, made significant progress in practical and social independence and in spoken language, and some progress in numeracy and literacy, between 20 and 30 years of age. (She was a slow starter and unable to copy her name legibly, read more than some 10 key words, or count to 10 at 16 years of age. Her speech was difficult to understand and mostly she communicated in 2 in 3 keyword 'phrases' and she liked her mum to help her with most daily living tasks. She is now considerably more independent and able in all areas, as readers of Living with Down syndrome will know). What levels of achievement can we expect? The first article identified some of the main trends in achievements and factors such as inclusion in education, which may influence them. However, it does not give the reader an idea of the actual skills that teenagers with Down syndrome may have in each area of development or the range of individual differences. The range of achievements for the whole group of 46 Hampshire teenagers is described in this article, with some comments on the implications of our findings for parents, teachers and carers. Most teenagers with Down syndrome are well on the way to personal independence and privacy in the area of self care. Almost all teenagers (some 85%) can dress and undress without assistance and manage most fastenings. A similar number can choose and find their own clothes each day and some 70% can choose appropriate clothes for the weather. Most teenagers (some 85%) choose their own new clothes and show a preference for fashion styles. However, only about half the group are completely independent when we consider personal hygiene as, while 92% can wash in the bath unaided and some 80% dry themselves unaided, only half of the teenagers can run a bath without help, only a third could wash their hair without help and only 10% could cut their own nails. Almost everyone was fully continent day and night (95%) and could go to the toilet without a prompt. However while some 90% could manage their clothing unaided in the toilet, 25% were still receiving assistance to wipe themselves, and 20% did not flush the toilet. While 65% washed their own hands without prompting, 35% did not. This means that overall some 35% of the teenagers still needed supervision in the toilet. (Those in mainstream schools were a little more independent in toileting, with some 25% still needing some help. The information was collected from parents and we cannot be sure that the teenagers need the same level of help at school without asking their teachers). Almost everyone could clean their teeth and brush their hair unaided, but less than half actually did brush their hair daily without help, presumably because parents felt that they could improve their teenager's appearance if they still helped. This raises the issue of encouraging independence. Parents need to be very aware of the importance of being independent for self-esteem and personal growth. It is not easy to let go and to accept that, while teenagers are learning to be competent they will not make as good a job of the tasks as when parents do them, but they will only reach a good level of competence if allowed to try for themselves. It is easy to continue to provide help for 11 and 12 year olds without considering what is age-appropriate and the need to begin to encourage independence and privacy. Most teenagers with Down syndrome will need more practice to become competent and therefore this should start early. The shower is often easier to manage than the bath, especially for washing hair and rinsing it adequately. Nail clippers are easier to learn to use than scissors, and learning to be fully independent in the toilet takes time and practice. In each area, teenagers need to begin to take over the tasks over a period of time, with parents teaching them how to do the tasks rather than doing them for them. Almost all teenagers (95%) could eat and drink completely independently though some 30% still needed assistance with cutting up food. Almost everyone (95%) could serve themselves from serving dishes on the table and 90% could help themselves to salt, pepper and sauces. Everyone could be taken out to eat in a restaurant. When it comes to making meals and snacks, everyone could help themselves to a biscuit, 95% could get a glass of water, some 64% could make squash and 82% could get a glass of milk without assistance. Half of the teenagers could make a sandwich, a piece of toast and a cup of tea or coffee. About a third of the teenagers could use a can opener, about 25% could use the microwave oven and only 10% could use the grill or the oven. In other words, beyond simple snacks, most teenagers could not prepare or cook a meal. However, most of them (80%) could lay and clear the table and about half could wash and dry the crockery. Learning to prepare and cook meals involves taking risks, using knives, hot pans, boiling water, grills, open gas or electric rings and hot ovens. However, in later teens, some young people become very skilled in cooking and many take catering courses. Like learning to carry out all personal hygiene tasks, teenagers will only learn to cook safely if they are able to learn the necessary skills, in small steps and with supervision. Most teenagers (86%) had their own bedroom and 65% - 70% took a pride in their room and kept it tidy. Almost all (90%) put up their own pictures and posters. Some 14% of teenagers helped with household chores. However, in terms of being able to be left alone at home, about a third of teenagers could be safely left for short periods of time but only 7% for longer periods. Most teenagers had the privacy of a room of their own, and were beginning to take some responsibility for tidying. We did not ask about doing the laundry or ironing, but most teenagers should be encouraged to learn all the domestic tasks which will enable them to care for their own rooms, laundry and shared areas in the house as they approach adulthood. The main reason that parents give for not leaving teenagers alone for long is their limited ability to deal with the unexpected. Most teenagers could be trusted not to do anything inappropriate or dangerous if left alone, but most teenagers could not yet use the telephone independently to call for help in an emergency. Some families were extending the time the teenager could be left alone in the house by enlisting the help of neighbors. If a neighbor is at home, the teenager can go to them for help if it is needed. Of the mainstream teenagers, 22% could go to a local shop alone, 83% had pocket money, 44% could cross roads alone and only one teenager walked to the school bus alone. Of the special school teenagers, 30% could go to a local shop alone, 65% had pocket money, 35% could cross roads alone and 13% walked to the school or work bus alone. It was only the oldest teenagers (over 17) that were traveling about independently in the community. This means that most teenagers could not travel about the local neighborhood without supervision. Learning to be independent in the community is another area that involves risk taking. However, the necessary skills will only be learned if a teaching program is planned and the young person able to learn over a period of time, in small steps. For example, when crossing the road, a teenager can be encouraged to identify the right place to cross - usually a proper pedestrian crossing with lights to stop the traffic - can press the light and be in control of deciding when to cross, while still being accompanied by an adult or another teenager. Similarly, bus skills can be learned by allowing the teenager to take the lead in asking for the fare and handing over the money, with an adult in the background to help if necessary. Slowly, the support can be faded in small steps. For some teenagers, the use of a mobile 'phone will aid their safety and independence - and reassure parents that they are safe. Important numbers can be stored so that they can be dialled with one key press if the teenager needs assistance. The level of independence attained during the teenage years will vary considerably between individuals, and most young people with Down syndrome will continue to develop their independence significantly during their young adult life. There were no overall significant differences in the personal or social independence skills of teenagers in mainstream or special schools and there was no significant improvement for teenagers in 1999 compared to teenagers in 1987 (see the first article in the last issue for details of these findings). The teenagers in the mainstream schools had not made the significant gains in social independence in the community that we had predicted would result from being in a local school. When we wrote about the findings of the 1987 survey, we encouraged parents to raise their expectations but we have little evidence that this has happened. In the 1999 survey, everyone is able to walk, to climb stairs with one foot on each step and some 90% of teenagers can jump with both feet together and hop on one foot. Everyone can throw and kick a ball and almost everyone (96%) can catch a ball. Almost all teenagers (93%) can swim without aids and ride a tricycle, with 36% able to ride a bicycle. We did not ask about the range of other sporting activities that teenagers may be skilled in but we know that some teenagers are skilled at gymnastics, horse riding, diving, skiing, baseball and football and that these activities are an important part of their lives. We would encourage all parents and teachers to support teenagers in a wide range of physical activities for two reasons, health and opportunities for social contacts and friendships. About half of all teenagers are considered to be overweight by their parents, and this tendency to weight gain, which is more significant after puberty, can be reduced by taking sufficient exercise as well as by healthy eating. Exercise will also improve gait and posture, breathing and general fitness. In addition, taking part in sporting activities can bring teenagers into contact with peers - both other peers with disabilities and typically developing peers. These sporting interests can continue to expand their social lives in their adult years. The communication skills of most teenagers, that is their ability to get their message across, is very good. Almost all teenagers (96%) could start conversations, participate in conversations, talk about past and future events, ask questions and use the telephone. However, getting the message across can be supported by actions and gestures, facial expressions and tones of voice and the listener's knowledge of the context and topic of the message. Almost all teenagers with Down syndrome have some speech delays and difficulties, that is, their speech is not as clear, fluent and easy to understand as that of their non-disabled peers. Some 33% of the total group were reported to have difficulty being understood by those unfamiliar with them such as assistants in shops or restaurants. In addition to the effect of speech phonology and articulation difficulties, the intelligibility of their messages will also be reduced because they are often not able to produce grammatically complete sentences. All the teenagers in the 1999 study were talking whereas in 1987 there were 3 teenagers in a sample of 90 with no speech at all. There were significant differences between the spoken language skills of the teenagers in mainstream education and those in special education settings. All the teenagers in the mainstream schools usually used sentences of 5 or more words but only 61% of those in the special schools. Some 40% of the teenagers in special education settings mainly used shorter 3 or 4 word utterances to communicate, some 13% mainly only one or two words and half used 'key-word' or 'telegraphic' utterances - leaving out the grammatical words and word endings and using mainly verbs, nouns and adjectives (The reader is reminded that the teenagers in special schools in this study were not less able - placement was based on where they lived at the time they entered school - see first article). Most teenagers understand more spoken language than they can use in their own expressive language. This is a very frustrating situation for them and it also often leads to the understanding of teenagers being underestimated. Importantly, the receptive language of the teenagers in the special education classrooms was not more delayed - only their expressive skills were significantly behind those of the mainstreamed teenagers. This suggests that some aspects of the inclusive education situation were enabling teenagers with Down syndrome to overcome some of the typical expressive language difficulties. One factor that the authors believe to be important is the extent of inclusion in literacy activities, where the outcomes for the two school systems are also different as described in the next section. All the teenagers in mainstream education were able to read and could read short sentences and simple books - simple in the sense of containing simple sentence structures - but with age-appropriate content and interest. Almost all (94%) of the teenagers in mainstream schools could read more than 50 words and simple instructions, 83% could read items in the newspaper and 78% read for pleasure. All the teenagers in this group knew the names of the letters of the alphabet, 89% knew all the letter sounds, 78% could sound out words when reading and 72% could sound out words for spelling. The reading achievements of the teenagers in special education were significantly behind those of their mainstream peers. Some 78% could read something and of this group, 83% could read their own name and some 'social sight' words (usually words with environmental and practical values such as 'ladies', 'gents', 'bus-stop', 'exit', 'police'). Some 39% of the readers could read more than 50 words and read simple books, 22% could read items in the newspaper, 48% could read simple instructions and 35% read for pleasure. Some 50% of the special education teenagers knew the names of all the letters of the alphabet, 41% knew the letter sounds, 32% could 'sound out' words when reading and 23% could 'sound out' words when spelling. When writing skills are considered, 90% of all the teenagers could trace over and copy letters and words and almost everyone (93%) could write their name. Of the teenagers in the mainstream schools, 94% could write their family names, 83% could write simple sentences and 61% could write their own address, simple messages, simple stories and a short letter. Of the teenagers in the special schools, 48% could write their family names, 30% could write simple sentences and their own address, 17% could write simple messages, 4% could write simple stories and 22% a short letter. The reading skills of most teenagers can be developed further during their teenage and early adult years and some may begin to read at this time. Reading and writing for teenagers with Down syndrome [DSii-07-05] contains detailed information on how to extend the reading and writing skills of teenagers, how to use reading activities to improve spoken language, and how to make even limited reading abilities relevant and useful in both special and mainstream schools (see Resources page 96). Overall, the arithmetic skills of the teenagers educated in mainstream schools tend to be significantly ahead of the teenagers in the special schools but not their money skills. All the teenagers in the mainstream schools could recite the numbers to 20 accurately and 94% could count objects to 20 and do simple addition with numbers within this range. Half of this group could recite the numbers to 50 and a third could count more than 20 objects accurately and recite numbers accurately to 100. While all the teenagers could add simple numbers, 78% could complete simple subtraction, 28% could complete simple multiplication and 17% could complete simple division. For the teenagers in the special schools the figures indicate that 69% could recite the numbers to 20 accurately and 52% could count objects to 20 and 61% could do simple addition. Some 26% of this group could recite the numbers to 50, 17% could count more than 20 objects accurately and 13% could recite numbers accurately to 100. While more than half of the teenagers could add simple numbers, 43% could complete simple subtraction, 4% could complete simple multiplication and 4% could complete simple division. When we consider money skills, all but one of the teenagers relied on shop assistants to take correct sums of money. The special school teenagers tend to be doing better with 48% able to count simple amounts of money and 26% able to give an approximately appropriate amount in a shop, compared with 33% and 11% of teenagers in mainstream schools who could do these tasks. When we consider general knowledge of time, only 20% of the teenagers could tell the time completely, all the teenagers in the mainstream schools could name the days of the week, and give their own name and age, 94% could say their own address, 89% their birthday, and 61% could name the months of the year. For the teenagers in the special schools 70% could name the days of the week, all could give their own name and 87% their age, 65% could say their own address and 43% their birthday and 35% could name the months of the year. Number for teenagers with Down syndrome [DSii-09-04] contains a wide range of activities to develop number, money and time skills for teenagers. It encourages parents and teachers in both special and mainstream schools to continue to develop a basic understanding of the number system and simple calculations, as well as providing tips for supporting functional use of time and money. If we consider leisure interest and activities, watching TV was the favourite and some 80% of teenagers watched TV often, 55% were interested in pop-stars, 74% were interested in pop music. Some 40% of mainstreamed teenagers and 70% of those from special schools listened to pop music often. Some 44% of mainstreamed teenagers were interested in sports, 33% interested in the cinema and 22% in fashion, with 70% of those from special schools interested in sport, 65% interested in the cinema and 43% interested in fashion. If we consider more passive activities, some 35% read often, 38% played games often, and 27% of mainstreamed teenagers and 48% of those from special schools often enjoyed drawing. Some of the group differences may be due to the fact that there are more older teenagers (over 18 years) in the special school group. This list of interests and activities includes many that are age-appropriate but the teenagers tended to be engaged in these at home on their own, especially as many had TVs and computers in their own rooms. All but one teenager could operate the TV independently and 80% could operate computer games. Some 58% of all the teenagers spend time with friends at least once a week. When we asked about these friends, 18% of the teenagers from the mainstream schools and 64% of the teenagers from the special schools had only disabled friends. Some 47% of the teenagers from mainstream schools and 9% of those from special schools had only non-disabled friends. About a third of all the teenagers had both disabled and non-disabled friends. These figures indicate that about 50% of the teenagers educated in mainstream schools had no disabled friends and that 64% of the teenagers educated in special schools had no non-disabled friends. The information provided on the sort of clubs attended partly explains these friendship patterns, as 55% of the mainstream teenagers and 43% of teenagers from specials schools belong to 'mainstream' clubs, and 65% of the mainstream teenagers and 56 % of teenagers from special schools belong to 'special clubs'. There was apparently the opportunity for more teenagers to have both disabled and non-disabled friends, as for example 65% of mainstream teenagers attended 'special' clubs but 18% did not make 'special' friends there. However, the information suggests that 35% of the mainstream teenagers never had the opportunity to make friends with disabled peers in or out of school and that some 57% of the teenagers attending special schools had little opportunity to make friends with non-disabled peers in or out of school. Information provided on going to parties and discos supports the above picture. While 69% of teenagers from mainstream education are invited to discos and parties organized for typical peers, only 16% of the teenagers from special schools receive such invitations. Some 80% of all teenagers go to discos and parties and some 40% go as often as every month, indicating that the groups of teenagers have equally active social lives but that those in mainstream education are more likely to go to inclusive or 'ordinary' social events and those teenagers from special schools are more likely to be going to 'special' events. The teenagers' social world and friendships are being strongly affected by school placements. In the authors' view these findings have negative implications for both groups of teenagers. The teenagers being educated with their disabled peers seem to have little opportunity to socialise in inclusive or non-disabled settings and are less likely to have non-disabled friends. This is likely to put them at a disadvantage in feeling at ease with and being able to communicate with non-disabled peers when they attend inclusive further education colleges, when they are in the workplace and when they are out and about in the community. In contrast, the teenagers educated in mainstream schools seem to be at risk of not having the opportunity to have friends with a similar level of disability for the close, special friendships and to find boy friends and girlfriends. Some 38% of the teenagers from the special schools had boyfriends or girlfriends yet no-one from the mainstream schools had a boyfriend or girlfriend at the time of the survey. The effect of these social experiences during the early teenage years (11-16 years) seems to have negative consequences for some of them once they leave school. We only have a small number of older teenagers (over 17 years) who have left a mainstream school, but they seem to have more restricted social lives than the older teenagers from the special school system. It seems as though it may be more difficult for them to find friends or partners, and to settle into a social network, than it is for those from special schools. The implications of these findings are that parents need to encourage friends with and without disabilities. The implications for schools and for an effective inclusive school system which can provide academic and social advantages have been discussed in the first article in the last issue. As has been indicated in other studies, brothers and sisters play an important part in the social lives of teenagers with Down syndrome as 83% of all the teenagers frequently join in social activities with their brothers and sisters. Only about 25% of the teenagers are reported to enjoy any of their social activities, without the support of a member of their family. As a consequence of limited independent travel skills, most teenagers are relatively socially isolated for their age. Most young people with Down syndrome have socially acceptable behavior and are sensitive to the needs of others and the personality and behavior issues are discussed in detail in the first article. Behaviour difficulties do reduce during teenage years, however a small number of teenagers (12% in mainstream education and 32% in special education) are reported to have significant behavior difficulties. If teenagers have significant difficulties, this is a significant cause of additional stress in families (see Issues for families with children with Down syndrome) and it interferes with the social and school lives of the young people. Most behavior difficulties can be reduced with appropriate planning of a behavior change program. 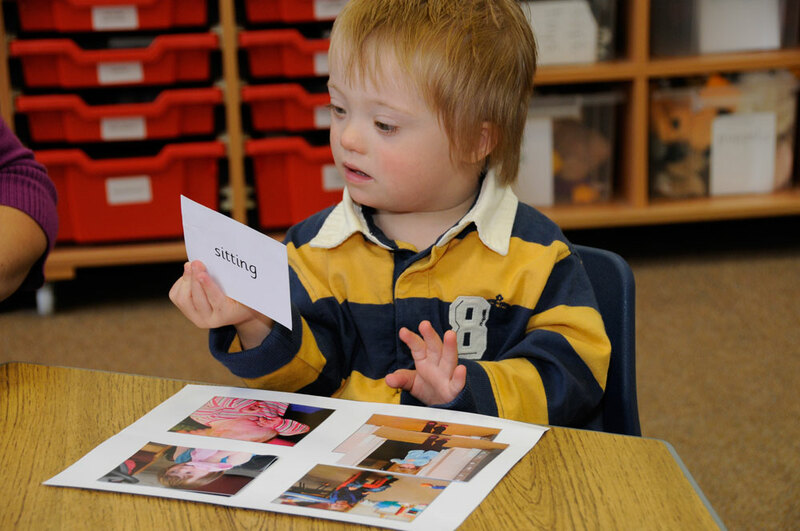 They do not have to be tolerated because the individual has Down syndrome and a plan to change them is in the interests of both the individual and the family (see Strategies for changing behavior and developing social skills for individuals with Down syndrome DSii-14-09). In summary, the social and leisure interests of teenagers are age-appropriate, but they are relatively socially isolated compared to typically developing peers. Teenagers with Down syndrome have friends, but cannot meet up with them easily out of school, limiting the opportunities for close friendships. The school placement of teenagers influences their opportunities for making friends with both disabled and non-disabled peers, and this may have longer term social and emotional consequences. Many teenagers with Down syndrome will be on the way to complete independence in personal care, able to choose their own clothes appropriately for the day, wash and bathe with minimum help, make a simple snack, answer the telephone and help with household tasks, but some will still need support for daily activities. Many teenagers will be quite socially confident in school and at clubs and only need minimal support to function in these settings. However, some young people with Down syndrome (15-20%) will still need a high level of support with their personal care and in social situations. Many teenagers will be progressing with reading and writing, with some teenagers able to write short stories and record their work in lessons while others still need full support to do so. Some teenagers will be calculating with numbers to 1000 or beyond but some will still be learning to count with numbers to 20. Teenagers will be progressing with their understanding of time and money at varying rates. It is possible for teenagers to benefit from access to the full school curriculum, differentiated to their needs, whatever their rate of progress, provided that there is adequate support in schools for this to be achieved. Most teenagers will be enjoying music, dance, drama, art and sporting activities and developing their skills at varying rates. In these activities, the enthusiasm and creativity of teachers will have considerable influence on the way in which teenagers with Down syndrome progress. Participation in these activities is not dependent on good speech and language skills and individuals with Down syndrome can often show considerable talent if given the opportunity. Mime and dance activities, for example, allow teenagers to express their understanding of emotions and behavior in a way they cannot do in daily life. Most teenagers with Down syndrome can behave in an age-appropriate and socially acceptable manner, at home, at school and in the community, regardless of their level of ability, if they are expected to do so. This is a very important goal, as behavior influences all aspects of teenagers' lives, and the lives of their families. During teenage years, difficult behavior causes stress in the family and reduces teenagers' learning and social opportunities. In adult life, a person who can behave in a socially acceptable manner can participate fully in community and social activities. In the authors' experience, less cognitively able adults with good social behavior will be working and leading more fulfilling lives than more cognitively able individuals with poor social behavior. Independence in the community will vary. Teenagers with Down syndrome who have been educated in fairly large mainstream schools will have had the opportunity to learn to find their way around a large site, to use the canteen for lunch (involving choices and the use of money) and they may be walking to school with friends, crossing roads or using the bus. Teenagers in special education may be part of much smaller communities (50 to 70 pupils rather than 1000-1500 pupils), with less opportunity to achieve these levels of independence. Out of school, teenagers' opportunities will vary according to the resources of the areas in which they live. Some teenagers may walk to a local shop or club if they are very close to home, by the time they are 11 years old, but most children with Down syndrome will become more independent in their communities during their teenage years. Most teenagers will still be supervised when they travel outside the home, but they should be learning to walk to local shops and to cross roads safely. Adolescence is a time for growth and progress for all teenagers, including those with Down syndrome, and there is much that we can do, as parents, teachers and carers, to continue to encourage independence and learning for our children. One of the most important issues is to recognise and respect the chronological age of each teenager with Down syndrome and to recognise that their social and emotional needs are largely age-appropriate, despite their language and cognitive delays. Their social understanding is usually more advanced than most people around them recognise. Teenagers with Down syndrome reach puberty at the same age as everyone else. They leave school and move on through life on the basis of their chronological age. As adults, they want the same things as everyone else, a home of their own with privacy, choice and dignity (even when it is only a bed-sitting room), useful employment and, friends, partners and a social life, and access to all community facilities. We need to have this vision of a right to an adult life and see our teenagers as on their way to adulthood - people first, like everyone else - if we are to help each one of them to achieve his or her full potential.